Best known perhaps for her performance as Holly Golightly in Breakfast at Tiffanies, the exhibition Portraits of an Icon offers an insight into the life and work of Audrey Hepburn that’s unexpectedly moving. Audrey Hepburn was never just an actress, never just a model – as the images reveal, she was a spirited, curious, caring individual, who began her career as a ballet dancer raising money for the Dutch Resistance in World War II, and spent her final years working as a UNICEF goodwill ambassador working in poor communities in Africa. In between came glitz, glamour and decades as a muse to couturier Hubert de Givenchy, but, as this exhibition shows, her beauty always far more than skin deep. Housed within Cheltenham’s splendid art gallery and museum, The Wilson, the images on show are accompanied by information on what was happening in Audrey’s life at the time each shot was taken, and includes less famous pictures, many of which capture moments of whimsy and apparent happiness. My favourites were those showing her relaxing at her rental villa in Italy with Bimba the donkey or grocery shopping with Pippin the fawn, suggesting that at heart Audrey was a country girl as at home in wellies and jeans as in a stunning red carpet gown. As she aged, the photos displayed reveal that Audrey’s attractiveness only intensified. There’s a genuine kindness in her eyes that makes it easy to understand why people from all backgrounds were drawn to her, a detail particularly evident in images caught towards the end of her life in Sudan and Somalia by Robert Wolders. Along with many others, I discovered Audrey Hepburn through films like Breakfast at Tiffanies and Roman Holiday, and entrancing as these performances were, it’s clear there was far more to this woman. This exhibition is a wonderful reminder of that. 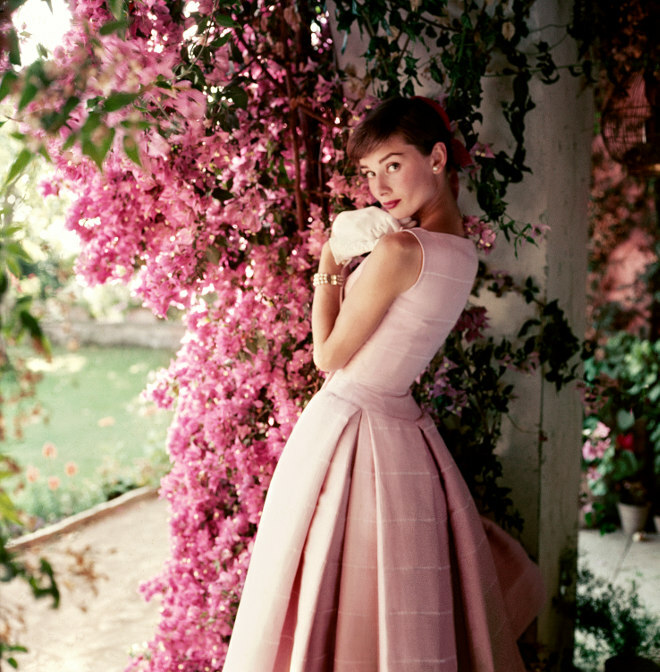 Audrey Hepburn: Portraits of an Icon is on at The Wilson until Sunday 14th February 2016. The exhibition is just one of many well worth visiting at the Cheltenham art gallery and museum. Today is one of those days when it feels like spring might actually almost be here. Recently I saw my first primroses and this morning I’ve noticed shiny little buds appearing in the garden. Yesterday, of course, was Valentine’s Day, which necessitated me making a card for my hubla. Inspired by Iviva Olenick’s creations, this is what I came up with. He cooked me dinner (bacon and mushroom pancakes, just a day late!) and we went to Watershed to see Audrey Hepburn and Gregory Peck in Roman Holiday. What a gorgeous film! Wed actually had a small row on the way there (isn’t that obligatory on Valentine’s Day? ), and were snuggling and kissing (our apologies to the lone man who sat beside us…) by the time the credits rolled. The power of storytelling, mmm? Today is one of my lovely writing days, and my main goal is to finish writing up the first draft of an interview with a woman who seems to live in a swirl of crocheted art, flowers and sunshine – I really need to find some new synonyms for the word colour. Then tomorrow I’m off to London to catch up with a dear friend and see the Harold Pinter play Old Times. Can’t wait, even if it does mean a dawn scurry to the Mega Bus!